So we all know that my main focus is on Italian wine, but I'm involved in some bloggers groups and occasionally I'll write about wines from other countries of the world as it's important to understand the world of wine in its totality. I do my best to still relate it to Italian grapes to still educate folks on the correlation of how grapes around the world may be related to Italian grapes and wines. 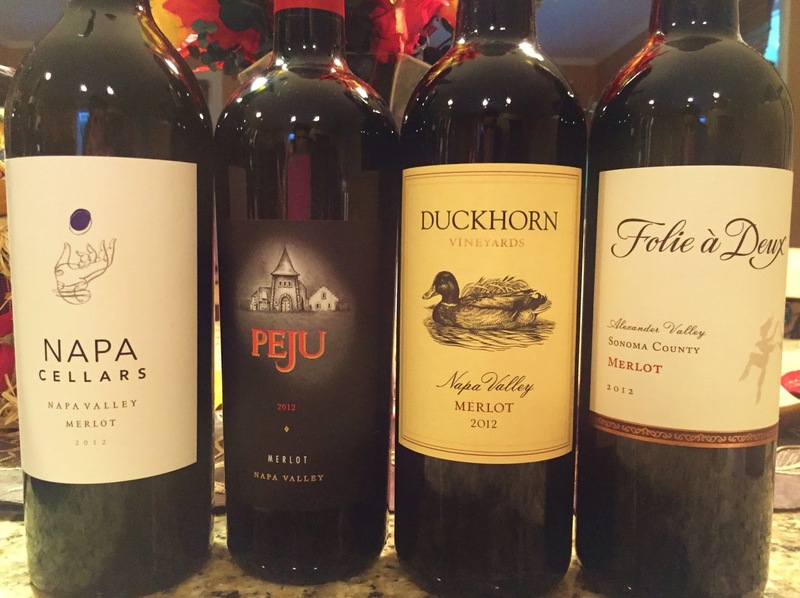 This month our Wine Pairing Weekend (#Winepw) group received merlot samples from a number of different producers for #MerlotMe month. Yes, there is a whole month dedicated to the merlot grape and this grape probably could use the recognition as it's been shunned, especially after the wine movie “Sideways”. It's not one of my most favorite grapes, but I have definitely had merlots that I enjoy and this month is to encourage folks to help merlot reemerge. All we need to do is just give merlot a chance people. Merlot is a grape that originates out of the Bordeaux region of France where it's highly present in the wines of France on what is known as the “right bank”. The well-known areas of the right bank are St. Emilion and Pomerol. As Jancis Robinson states in her book “How to Taste Wine”, “Merlot is to St. Emilion and Pomerol what Cabernet Sauvignon is to Medoc and Graves” on the left bank of Bordeaux. Merlot is a thin skinned grape that produces wines that are softer, rounder with fruit, but this depends on where it's coming from. Today there are many producers that are producing single varietal merlot wines, but it's been used a lot as a blending grape. All the wines presented today are from California, specifically Napa Valley and Sonoma County. Of all the wines I sampled I enjoyed the 2012 Duckhorn Merlot the most with the polenta and sausages. 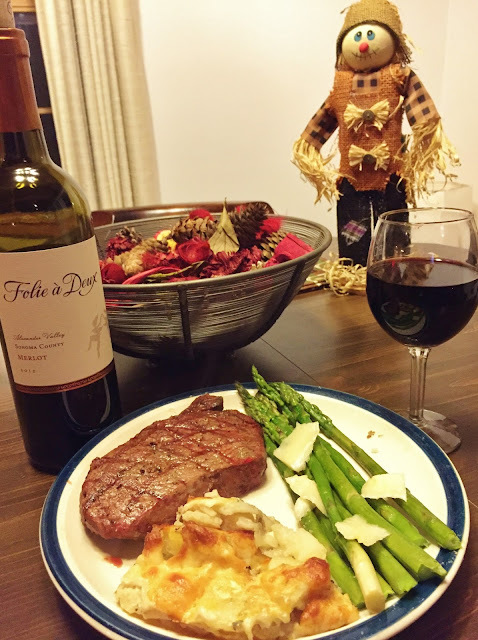 I made a couple dishes and played around with the pairings including a rib eye steak with parmesan encrusted baked potatoes and an Emilia-Romagna side dish of asparagus with parmesan cheese. 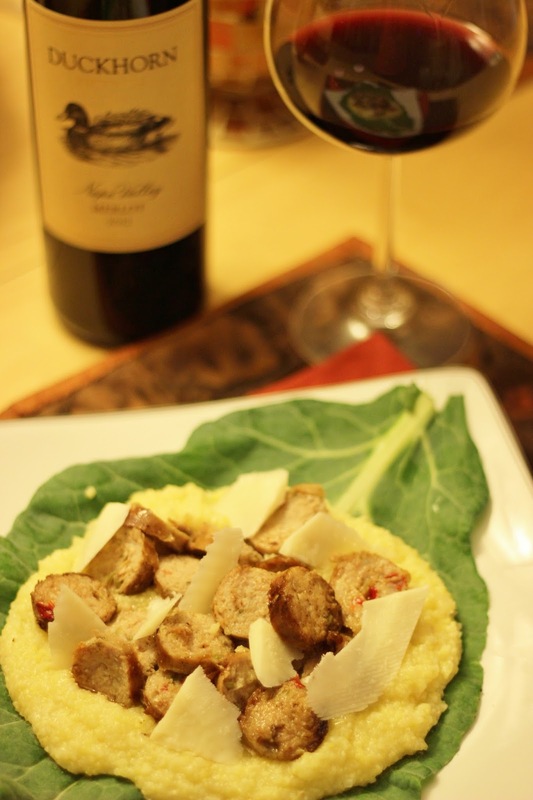 Another night I made polenta with sausages, a typical dish of Friuli-Venezia Giulia, aka Tre Venezie. To say the least I had lots of leftovers when it came to wines and food, but who can complain about these types of problems in life. As you'll see later in this post, merlot is found in Italy within this region so it was interesting to pair a dish typical of Italy with the merlot of California. It's been awhile since I've had a merlot from Italy. I would've loved to have done a side by side comparison. The 2012 Duckhorn Merlot of Napa Valley was my main pick. It's made primarily of 88% merlot with the rest being cabernet sauvignon, cabernet franc, petit verdot and malbec. I found this wine to be rich, with lush red and dark fruit. A rather round wine with notes of vanilla and some spice. Not an everyday wine though retailing about $50. I don't always judge a wine by it's price, but in these selections it was my pick of the litter. My second runner up was the 2012 Peju Merlot from Napa Valley paired with tomato bisque and a side of some bruschetta brushed with extra virgin olive oil and garlic and topped with a goat cheese spread. 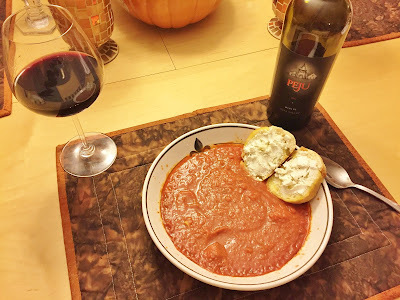 It was my first time making tomato bisque so I would make some changes to my recipe, but I enjoyed the Peju much more paired with the tomato bisque and once it was aerated. Is Merlot used in Italy? Merlot is found in many countries of the world including the US, France, Chile, New Zealand, South Africa as well as Italy. One of the things that folks love most about Italian wines are the hundreds of varieties of native grapes found throughout Italy. Surprisingly, merlot is actually the 5th most planted grape in Italy. In Italy you'll see it used as a blending grape, most notably in the wines known as Super Tuscans of Tuscany. Merlot is also known for being grown in nothern Italy in the Tre Venezie where it produces a very different style merlot that is leaner. Merlot is a grape that varies much from producer to producer so try it from country to country and seek out some of the top producers to get a sense of Merlot's true potential. See what our bloggers have cooked up!